Wireless networks originate from an array of wireless technologies, such as Wi-Fi 802.11, Bluetooth, ZigBee, Z-Wave, WirelessHART/Dust Networks, ISA 100a, multiple versions of 802.15.4, and a mix of ISM-band-based (industrial, scientific, and medical) proprietary versions. But due to complexity and high power consumption, many are less than ideal for some sensor networks. In applications that emphasize battery power, battery life, and low maintenance, even fewer technologies can pass muster. However, two standards have emerged to address short-range, low-power, low-maintenance networks: Bluetooth Low Energy and ANT. There are multiple ways to implement a wireless network, depending on the application (Fig. 1). A wireless node (each circle in the figure) may be a transmitter (TX), receiver (RX), or transceiver (TX/RX). Some nodes are just slaves to be monitored or controlled. Others become managers or data aggregators for connections to external communications. Some nodes may also serve as repeaters to relay data from one node to another. Figure 1. The most common topologies for wireless networks are point-to-point (a), star (b), tree (c), and mesh (d). Each node is a transceiver, and each network has a master controller. The point-to-point (P2P) link is the simplest form (Fig. 1a). It could be a single transmitter to receiver link, or both nodes could be transceivers. A transmit node would be a sensor. A node connected to an actuator device would be a receiver. Another common topology is the star configuration (Fig. 1b). Multiple nodes connect to a central collection or control node. Thus, it’s called a multipoint-to-point (M2P) connection. The nodes don’t talk to one another, just to the central collection point. A star network could work the other way in which the central node broadcasts to all other nodes, though, making it a point-to-multipoint (P2M) link. A tree network can have many branches (Fig. 1c). This one shows a star network talking to another star network through their central controllers. Another popular configuration for sensor networks, mesh, can be configured into a number of variations (Fig. 1d). The key characteristic is that all nearby nodes can talk to one another. Furthermore, all or most nodes can be repeaters, whereby data may be passed from one to another that’s not directly connected. For example, node F can’t connect directly to node A because of distance or power limitations, but it can pass the information through other nodes (e.g., B or E and C). This mesh feature makes it possible to extend the network over a very wide range that’s beyond the normal reach of most nodes. In addition, a mesh network offers great reliability. If one node goes down because of battery or other failure, or a node is temporarily blocked in some way, alternate paths are found through the network to transmit the data. Mesh networks tend to be more complex, but the range and reliability they provide may be worth the added expense. All of these networks have a central control or collection node. It could be a laptop computer, a cell phone, or some special router device that connects to a local-area network (LAN) or the Internet. This master control point stores and forwards the information to the appropriate destination. Bluetooth Low Energy (BLE), a low-power variation of the original Bluetooth standard that emerged in 1998. Bluetooth SIG manages, develops, and promotes the standard, as well as certifies products as interoperable. 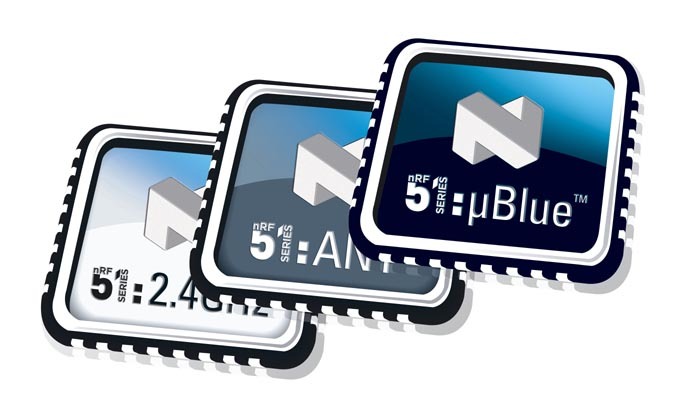 BLE was defined as part of the most recent standard specification Bluetooth v4.0, which includes the legacy Bluetooth v3.0 and BLE. BLE also is known as Bluetooth Smart—a marketing name for low-power devices. Bluetooth, probably the most widely implemented short-range wireless technology including billions of cell phones (headsets) and millions of laptops, will further expand worldwide with the Smart version. Bluetooth Smart uses a different set of technical and radio techniques to ensure very low power consumption. The data protocol was changed to create low-duty-cycle transmissions or a very short transmission burst between long periods. In addition to extremely low-power sleep modes, the low duty cycle allows a Bluetooth Smart product to operate for many years on a coin cell. BLE still operates in the same ISM, license-free, 2.4- to 2.483-GHz frequency band as standard Bluetooth. However, it uses a different frequency-hopping spread-spectrum (FHSS) scheme. Standard Bluetooth hops at a rate of 1600 hops per second over 79 1-MHz-wide channels. BLE FHSS employs 40 2-MHz-wide channels to ensure greater reliability over longer distances. Standard Bluetooth offers gross data rates of 1, 2, or 3 Mbits/s, while BLE’s maximum rate is 1 Mbit/s with a net throughput of 260 kbits/s. BLE also uses Gaussian frequency shift keying (GFSK) modulation. Other BLE features include a 0-dBm (1 mW) power output and a typical maximum range of 50 meters. Latency measures only 6 ms. The combination of an adaptive frequency-hopping technique (which avoids interference), a 24-bit cyclic redundancy check (CRC), and a 32-bit message integrity check improves link reliability. Security is 128-bit AES. P2P and star are the most common network configurations. One key point must be taken into consideration, though: BLE is incompatible with standard Bluetooth. BLE devices don’t interoperate with classical Bluetooth products. However, implementing a dual-mode device could achieve such interoperability if so desired. A dual-mode device is an integrated circuit that includes both a standard Bluetooth radio and a BLE radio. Each operates separately but not at the same time, though they can share an antenna. Several vendors offer dual-mode chips, such as Broadcom, CSR, EM Microelectronics, Nordic Semiconductor, and Texas Instruments. Complete modules also are available from connectBlue (Fig. 2). Figure 2. Complete Bluetooth modules developed by connectBlue include a classic Bluetooth module, a Bluetooth Smart Ready module that supports both standard Bluetooth and BLE, and a Bluetooth Smart module that includes only BLE. ANT represents another ultra-low-power, short-range wireless technology designed for sensor networks and similar applications. It, too, uses the 2.4-GHz ISM band. The proprietary protocol is developed and sold by Canadian company Dynastream Innovations Inc., a subsidiary of GPS personal navigation firm Garmin. So far, its primary application is in the sports and fitness fields to implement personal-area networks for performance and health monitoring. However, it’s applicable to all of the other applications described earlier. ANT also uses the very short duty-cycle technique and deep-sleep modes to ensure very low power consumption. It operates for years on a coin cell, too. Each ANT node can operate as a slave or master and can transmit and receive as well as function as a repeater. The ANT protocol is set up to use a single 1-MHz channel for multiple nodes thanks to a time-division-multiplex technique. Each node transmits in its own time slot. Basic message length is 150 µs, while the message rate—the time between transmissions—will range from 0.5 Hz to 200 Hz with an 8-byte payload per message. A 16-bit CRC is used for error detection. Up to 65,536 time slots can be accommodated per channel. If interference is encountered, the node transceivers can switch channels. Once again, modulation is GFSK. ANT+ is a relatively recent addition to ANT. This software function provides interoperability in a managed network. It facilitates the collection, automatic transfer, and tracking of sensor data for monitoring all involved nodes and devices. SensRcore, another ANT feature, is a development system that helps developers create low-power sensor networks. ANT transceiver chips are available from Nordic Semiconductor (Fig. 3) and Texas Instruments. Figure 3. Nordic Semiconductor makes chips for 2.4-GHz wireless networks. Included in this group are a generic model (left), a chip with an embedded ANT protocol (center), and an IC with an embedded Bluetooth Low Energy protocol (right). A number of similarities exist between ANT and BLE, but their differences are stark (see the Table 1). Both are good choices for very low-power applications. ANT has the simplest protocol with minimum overhead, and it supports more different types of network topologies. BLE is a star-only format, while ANT supports all types including mesh. More vendors offer Bluetooth chips and modules versus ANT, though. Table 1. Comparing the Technologies.